The LAB-XT is designed specifically for experimenting with telephony devices. It includes the circuitry needed to interface to a standard, loop-start telephone line, or POTS line. The LAB-XT is meant to be used as a development tool only. Although the circuitry is fully compatible, it is not certified by any regulatory agency for connection to a telephone network. Development should be performed using telephone line simulators for testing. Should you decide to ignore this warning, MCUmart.com and microEngineering Labs, Inc. accept no liability for fines or damages resulting from unauthorized connection to a telephone network. Many projects are possible including telephone, digital answering machine, call forwarder, callback device, caller ID terminal, telemarketing blocker, DTMF remote control, DTMF digit grabber, call data recorder, and more. The LAB-XT line interface is fully isolated with a transformer and opto-isolators. It senses loop current and ring signal, and is equipped with a relay-switched load that allows the MCU to switch the line off-hook and on-hook. DTMF digits are received with a dedicated IC (MT8870), which the MCU can then query for the dialed digit information. The LAB-XT can send and receive both DTMF and pulse-dialed numbers. An FSK device (NJM2211) receives caller id information and converts it to 1200 baud serial which the MCU can read. PicBasic Pro sample programs are provided that show how to interpret the received caller information string. A 2x20 LCD module allows you to display user prompts and caller id. A PC-mounted speaker is included, allowing audible ring tones. Red LEDs are provided for status indication and debug purposes. 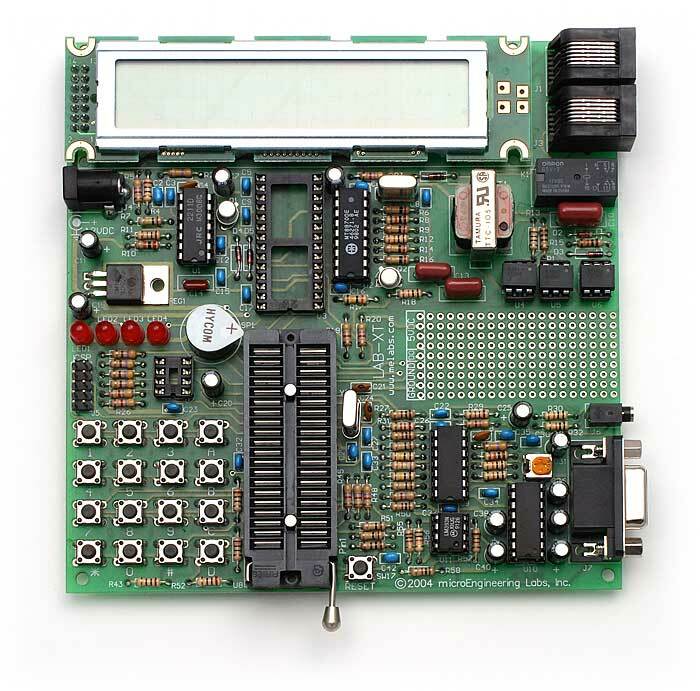 The 4x4 keypad matrix can be used for control and can be configured as a standard telephone keypad. PicBasic Pro sample programs demonstrate keypad dialing. The built-on audio amp is capable of driving a headset (headset not included). It also has filtering to accommodate the PicBasic Pro DTMFOUT and FREQOUT commands. This allows you to generate prompt tones, dial tone, busy signal, ringback, special information tones and more. Size is 5.5" x 5.6"